Activision has never been afraid to embrace the future with the Call of Duty franchise. When World War II fatigue set in, it reinvigorated the series and brought its timeline forward with the classic Modern Warfare. It allowed Treyarch the chance to get creative with the franchise, resulting in the well-received Black Ops games. When Infinity Ward wrapped up the Modern Warfare story arc after three entries, it started an entirely new universe with Ghosts. With a new generation of consoles upon us, it’s time for the series to be brought forward once again. Developer Sledgehammer Games has a bold vision for the future of the franchise, in terms of both storyline and the brand as a whole. 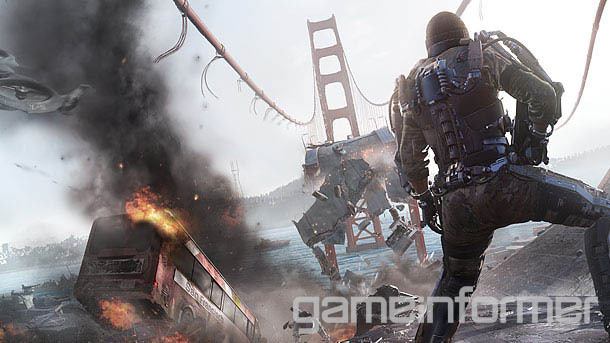 Advanced Warfare is the newest universe in Call of Duty, and it begins in 2052. Former Dead Space developers Glen Schofield and Michael Condrey (along with their talented team at Sledgehammer Games) have carried out an exhaustive level of research on future weaponry and technology, attempting to make their solo debut as authentic as possible. They’ve consulted with the government, futurists, and scientists to ensure that Advanced Warfare is a realistic vision of our future rather than a lazy collection of robots and lasers. Our June issue features 12 pages full of information about Sledgehammer’s ambitious title, which is the first Call of Duty to benefit from the new three-year development cycle. 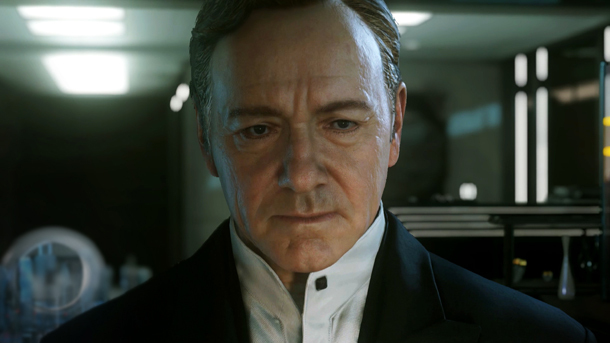 We spoke with Schofield, Condrey, Activision CEO Eric Hirshberg, futurist Michael Belfiore, actor Kevin Spacey (who plays Jonathan Irons, head of the Atlas Corporation that is critical to the story), and more for the article, which details the origins of the game, its development, and an exclusive look at two distinctly different missions. To see a taste of the game in action, you can watch the game’s debut trailer right here. Features this month include a six-page look at the upcoming Skylanders: Trap Team, as well as a six-page piece on the recent trend of empathy games that deal with unconventional and serious issues. The space combat simulation genre is coming back, and we take a look at its upcoming titles in our Space Race feature. A group of engineers that happen to be huge gamers have found ways to recreate their favorite games in the real world, and we’ll tell you about it in our look at Waterloo Labs. In addition to our cover story and features, the June issue contains previews of Borderlands: The Pre-Sequel, Destiny, Lords of the Fallen, Dragon Age: Inquisition, and more. You can also read our reviews of Child of Light, Trials Fusion, Lego The Hobbit, and Kirby: Triple Deluxe. Print subscribers should see their issues arriving in the next week or two, but it will be available later today if you subscribe digitally (available on PC/Mac, iPad,Android, and Google Play). You can also get the latest issue through third-party apps on Nook, Kindle, and Zinio starting on May 7. To switch your print subscription to digital, click here, or to create a new subscription to the digital edition.